Music festival season is once again upon us, and with it a slew of girls making the pilgrimage to Urban Outfitters and Free People in search of the perfect bohemian flower child wardrobe. Festival fashion has become a bit of a cliché over the years—a mix of wannabe Woodstock attendee and try-hard eclectic music lover. Take a shot for every flower crown or pair of Birkenstocks you see and you might die of alcohol poisoning before the first headliner even steps on the main stage. WhoWhatWear's Jessica Schiffer wrote a great little article about her thoughts on festival fashions and the done-to-death nature of Coachella chic that I felt really got at the root of what frustrated me about festivals in the first place. At first, the flower crowns and the crop tops were sparse and stood out, but now they have taken over, leaving no room for originality. So how does one make festival attire interesting once again? After all, festivals like SXSW, Coachella, and Lollapalooza are where the everyday concert-goer has a chance of being snapped by a major street style blog or fashion website, so the pressure certainly is on to look one's best. Instead of reaching for a Navajo-inspired bikini top or a pair of denim cut-offs, look to simpler designs in clean, raw fabrics and interesting shapes. 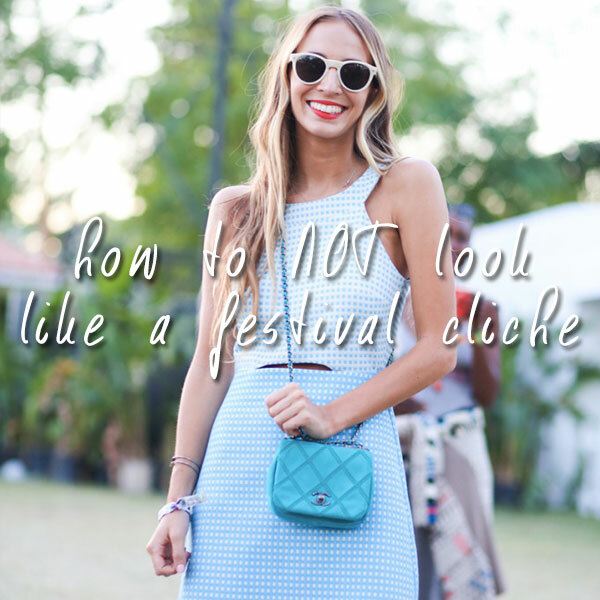 No one said that in order to look fashionable at a music festival one had to look like a caricature. Below are some sure-fire outfit formulas that will get you noticed at festivals while offering something brand new (aka not overdone) to the world of festival fashion. Take a style cue from Taylor Swift and wear a matching set—it will make you look instantly put-together while still allowing you to show off some skin and stay cool during the hot afternoons. A white eyelet crop top & shorts combo is the dream, but any matching set will do. 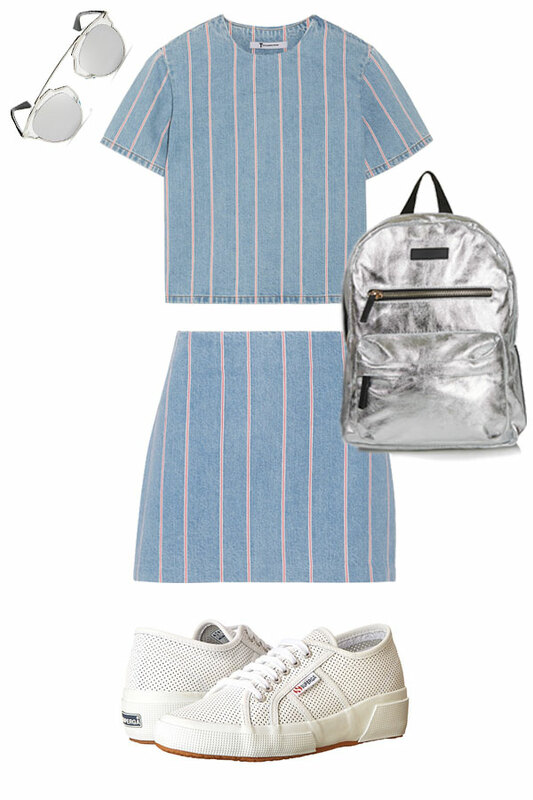 Sneakers dress down the look, and a sculptural backpack keep the outfit modern and playful at the same time (plus, backpacks are so functional!). This look is all about comfort and ease. 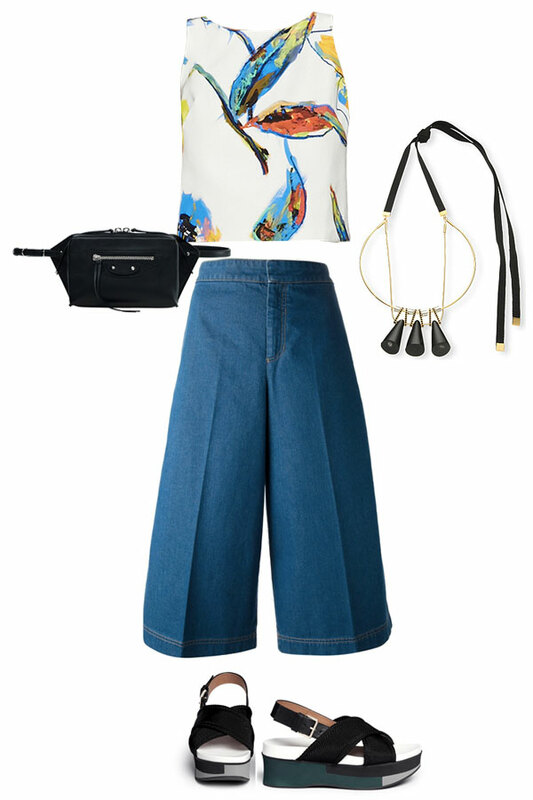 A loose top and culottes will give you plenty of room to breathe; all the better to dance around in! Flatforms are one step above the typical flat sandal and will keep your feet from aching. When in need of an easy outfit, a good dress is all you need. Calf-high gladiator sandals add a touch of trendiness, and a crossbody is fashionable functionality at its finest. Flower crowns are, for some reason, the festival headpiece staple, but you are more original than that! There are plenty of fun headpieces and hair accessories that don't involve cheap-looking fake flowers. Bandeaus, swimsuit tops, etc. They usually are paired with a pair of too-short denim shorts and scream, "It's too hot outside to be fashionable" which is a statement you should NEVER utter! You can always be chic, even when the sun is beating down and those tents are stuffy and gross. I know you have more creativity than that. And seriously, NO NATIVE HEADDRESSES or any other form of Native American dress. That is cultural appropriation and it is offensive and silly, so just don't do it. Headdresses are sacred ceremonial items, and they were not made so you could look "unique" while jamming out to some underground rock band and smoking pot. Still in need of inspiration? Check out my new "Festival Ready" Pinterest board for shoppable items that are perfect for your next music festival! Love these options especially the matching set, it's perfect for when you've stayed out too late and can't put together a proper outfit the next morning lol. Thanks for reading, Anastasia! The matching set is such a great idea because it's an easy outfit, plus you really get three pieces for the price of one (top, bottom, and top/bottom together). From a clothing investment standpoint, the matching set is perfect! Finally someone said it, there are fancy yet comfy and casual ways to enjoy these festivals.